Competition Team: Peter Tansey, Deirdre Spring, Hannah Sciafe, Marc Golden + Scott Morton. 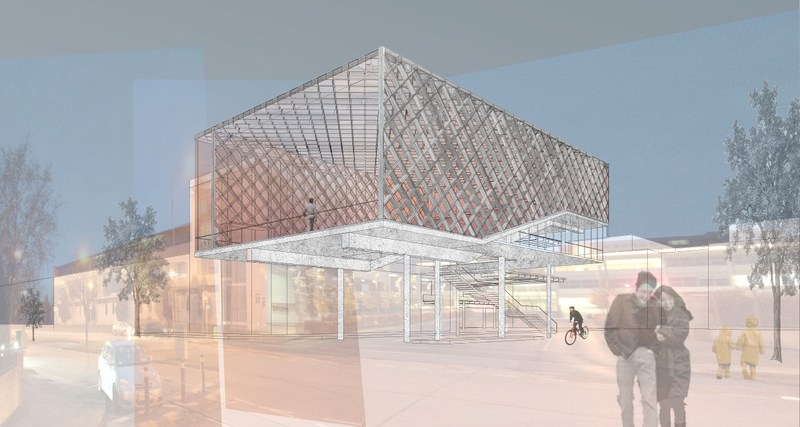 This project sets out to establish a vibrant social space between the buildings on the campus. By covering and protecting this space the social and cultural life of the university is allowed to thrive. This intention is carried out in a phased strategy starting at the entrance. The entrance phase provides for a raised hall which can be indoor or outdoor, auditorium or a hangout space. It is window to the city and the frontispiece of the university. It is open both physically and programmatically, inviting appropriation – an in-between space for students to make their own. Beyond the entrance the proposal is to connect up the campus by an open colonnade providing easy continuous connection between the faculties and at the same time providing a space for the interaction of the university population – a place for the creation and exchange of ideas.